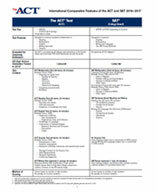 ACT offers education and workforce services to organizations throughout the world. ACT Education Solutions, Limited, is an ACT subsidiary that offers curriculum that helps international students prepare for study at English-speaking universities around the world. Learn more about the Global Assessment Certificate Program. Also learn more here if your institution is interested in becoming a Pathway University (PDF; 34 pages, 3.9MB). Register to take the ACT® college readiness assessment in your country. Visit the ACT Student Site. Evaluate international students as you do with US applicants to your undergraduate programs. Just as you do with domestic students, use ACT scores from international students to evaluate and validate your international applicants. The ACT is administered in 130 countries worldwide. By requiring your international students to take the ACT as part of your school’s admissions process, you can compare a student’s performance to the ACT College Readiness Benchmarks and immediately know the student’s English proficiency. You can reduce your risk by evaluating and comparing the ACT scores to the student’s high school transcripts as a validation of the student’s college readiness. Do You Want to Use ACT Services Internationally?